The tourist board i tourist agencies in Živogošće, offer the possibility of taking one – day excursions to surrounding places. Each place has good quality restaurants, shops, cafe-bar terraces and news-stands, and the seasonal post-office is in Porat. There are excursion boats leaving every day towards the islands organizing fish picnics as well. Mount Biokovo offers various options for trekking and mountain climbing. You take a minibus for one part of the road, and then take a walk to St. Jure hilltop (1762m) or take a 5 hour long tour of Biokovo through the fields and pine forests. Make sure you bring enough drinking water with you. Another popular tourist destination is the Botanical garden near Kotišina village next to Makarska. It can be reached by a path from Makar. On wooded hills nearby Makarska, in a very entrance of the city lays Croatian lourdes shrine of Vepric. The whole landscape that surrounds the shine looks like one of the most popular shrines – Lourdes. It was established in 1908 in natural cave surrounded with Mediterranean plants and with stream nearby just like in Lourdes. The shrine has a chapel with sacristy, altar on the square, confession booths, Stations of the Cross, area for spiritual exercises and paths for processions. This is one of the most visited Croatian shrines and inevitable pilgrim place on a way of spiritual recover. This location is especially visited on August 15th, on a holy day of Assumption of Mary. At the same time because of its natural beauty and extraordinary peace the shrine is visited throughout the year. It is located on river Cetina estuary. Omiš is town of rich and famous history, ones a pirate seat from where they ruled the Adriatic, today is a centre of beautiful Omiš Riviera. It has become the most desirable Dalmatian and Croatian destination for the active vacation fans. Rafting on Cetina River, free climbing and sea sailing are on the reach of your hand. Omiš is famous by its beautiful long sandy beaches and slope mountains that are falling right in to the sea. It is also famous by the Festival of Dalmatian “klapa” within Omiš cultural summer. Many churches and old stone fortresses that you should visit are only a part of charm and offer of this small town. The city often called “The most beautiful in the world” has around 200 000 inhabitants. It is over 17 centuries old and thanks to the fact that roman Emperor Diocletian has chosen that place to build his summer house, it became one of the most famous cities on Mediterranean. It is under UNESCO protection and has entered into the register of the World Cultural Heritage. It is located in a very centre of Adriatic coast. Split abounds with numerous cultural and historic sights and entertaining program. Night life takes place in many restaurants, clubs and discotheques. By day it is full of walkers and tourists that admire its beauties. The famous city walk – Riva, is a seaboard that stretches along the south walls of Diocletian palace. It is the most popular meeting place for citizens and city visitors. Split is the second largest city in Croatia and an important port for tourist transfer toward the islands and Italy. 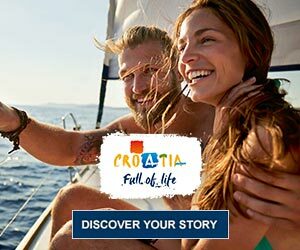 Daily, a great number of ferry boats navigate in direction of islands Brač, Hvar, Korčula, Vis and Šolta that all are attractive tourist destinations. Imotski is located deep into the outback of Dalmatian zagora. It is 50 km far from the sea but has marks of a small maritime town. Harmonic architecture based on stone and pleasant Mediterranean clime makes this inland town more maritime. It is located on 440 meters altitude from where you have a beautiful view on Imotski field. Near Imotski there are two hydrographical and geomorphologic natural phenomena. At the edge of the town lies Modro jezero (Blue Lake). In summer months it is also a bathing area. Because of its exceptional blue water people gave it such name. About 1 km away from the town in north-western direction lies another Imotski lake – Crveno jezero (Red lake). Red because of the red stones that surrounds the lake. Red lake is the deepest in Europe. Lake deepness is between 390 and 490 m, and the water deepness is around 250 m. Many stories and legend are connected with Blue and Red lake. They are far known tourist attraction and inevitable destination for visitors that like natural beauties. To drop the stone in the lake looks easy but only few have managed. In a short time it becomes a real torment. You could also attempt in this adventure.